....will be our next Frock by Friday™! I'm so excited. Here are some ideas for shirt dresses to get your creative juices flowing. It comes in sizes 34-46 which is 4-18 in US terms. Some of you had issues with the length of the dress. I will add a step so that you can lengthen the skirt to suit your needs. Also, the skirt has a light elastic at the hem which I've never seen before. I don't know if I will like that but I will do it with and without for those of you who do not want it in their version. Here are the instructions. They are translated to English. Do you think this Monday is too early too start? How much time do you need to get your materials together? Any questions just leave me a comment and I will try to answer them. I just got a sewing machine for Mothers Day. Never used one before, but I'd love to start with you. Do you think this is to complicated for a TRUE beginner? can you post a link to the original German text? I know German so I can try polish the Google translation a bit... Thank you. Monday is too early for me. I have to work on sewing orders this Monday and Tuesday. Yes, I think it should be good for a beginner. And of course, I am happy to answer any questions! The first thing I ever sewed was a button down shirt which this is very close to. I didn't do the last frock by friday, but I think that I will do this one, it's too lovely to pass up. Will we be starting this next Monday? Looks like a fun project. I'm not sure if I will join or not, I'm having trouble finishing the things I planned as it it already, but I'll surely follow all your process. I can't wait to see all the (no doubt fabulous) variations of this dress! Since you have such a great eye for color...can you give us an idea of what colors your dress will be? i especially love the red strip version with the crossover sleeve. Also, what type of fabric would you recommend for this project? And finally, I think for the next installment of this series, you should do one of your own patterns! That would be fun! 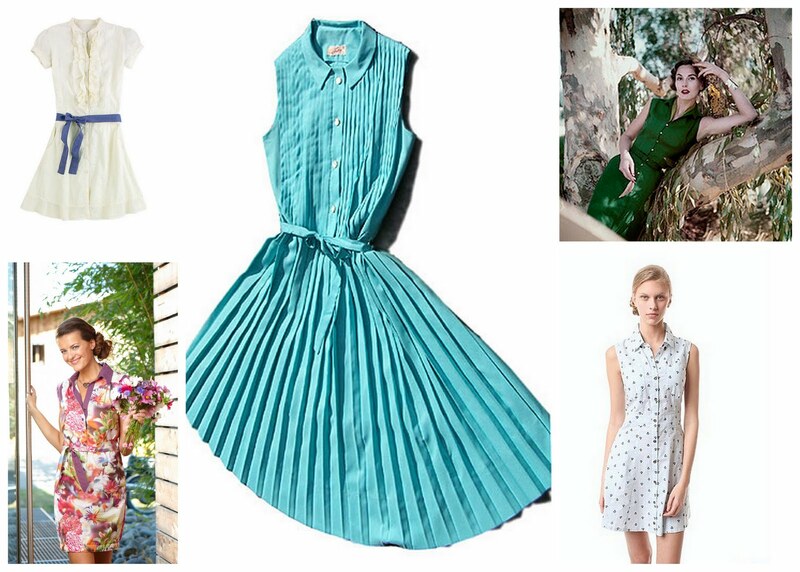 I have been following your blog for a little bit now and I LOVE that you do frocks by Friday. I always feel overwhelmed making clothes for myself because I feel like it will take forever! So I generally stick to clothes for my kids. :) But THIS time I'm going to attempt doing the frock by Friday. Wish me luck. Thanks for your terrific blog! I'd like to do this too. How do you know what kind of fabric to use? I've sewn a number of cloth diapers but no clothing. And I get totally confused trying to figure out fabrics work for clothes. Can you use quilting fabrics for clothing or is that a big no no? Thanks so much for doing these frock-by-Friday series. They make creating a garment so approachable! If enough people say they're ready I will try to start it Monday. If not, I'll wait until the week after. Monday is early for me...I'll be out of town this weekend and I need to scrape up some $$ for the material for this one, which I REALLY want to make. Anyway, I can always sew along later with the tutorial. I'm finishing up my second coffee date dress and like this one even better. Going a size down made a big difference! Looking through my fabric stash right now. I will be ready on Monday. Thank you for doing this! I have this problem a lot myself. Usually I go by my waist and even if the bust is too small it all works out. However, what you could try would be to go with the larger size that accommodates your bust and when you are sewing the bodice front to the bodice back take some in on the sides so that it matches your waist. I actually got spoonflower to make me a close replica of the fabric in the original pictures with the flowers. I loved it so much. So I'll be trying to make it look as similar as I can to the original version. Can we please please start this monday ?? I would really love to do this thanks! I can absolutely try to give you a sleeve tutorial. And the fabric is up to you. But I would go with something cotton, maybe polyblends. Nothing too heavy like bottomweights or to gauzy that you can see through. Absolutely! It's a VERY simple fix. Quilting fabrics would work. Just be sure they are not too see through as I don't think we'll be sewing a lining. I would go with something either cotton or polyblend. I'd love to do this dress- and hopefully it is a beginner level pattern since I'm new to sewing. I'll be looking for fabric this weekend!! are we making this together??? omg i CANNOT wait!!! i love dresses with belts! ok, i'm going to go fabric shopping this weekend!! Oh, I'm so glad you decided to go with this pattern! I haven't sewn anything for myself in a looooong time, and I love the idea of taking it in little bites, day by day. It just so happens that Whipstitch here in Atlanta is having their grand opening this weekend...what a great excuse to go fabric shopping! What width of bias tape? Monday is a little early, but I think I can get all my supplies this weekend. Ok, I will not let the buttonholes scare me away. I am in. I will likely be one day behind but I am overdue for a sewing success. I opened up the translated instructions and...some of the words did not translate from German and some are translated into phrases like, "Home Affairs passport". I look forward to translations from people like Ana:). Monday works great for me! YAY! I'm really excited for this next sew-along. I will not be in town Monday, but don't let that stop you because I can catch up on Tuesday! Thank you for doing another sew-along! That's a pretty dress. I'm in, but I'll have to try to get all my supplies this weekend. Oh man! I am so EXCITED! This is just the dress, I have been wanting to make! Thanks for such a great pattern choice! Those translated instructions are funny. I guess I'm easily amused. I found the english version of the pattern. Here is the link. Thanks again for choosing such a fun pattern. I'd say about 1/4" to 1/2". Get it to match your sleeve and dress. My man will be out of town all next week! This will be the perfect thing to keep me busy! I forgot to mention...what great photo's of inspiration! So many different styles of the same dress. It makes me put my creative thinking cap on. Thanks for showing so many! I will be ready by Monday! This dress is very cute, and I'm glad to see it doesn't include a zipper! The zipper has been my demise in the coffee date dress but I'm determined to conquer it before Monday. I just pieced together the pattern in photoshop to print on a large printer. It looks like a piece is missing(#35 the collar) when I compared it to the line drawing on the instructions. I scaled the little line drawing to match the pattern so I think we could get that extra piece that way and I can email it to you to share with everyone if you'd like. Also, in the drawing it looks like it has pockets. Anyway you could show us how to incorporate those? Thanks! I'm very excited if you couldn't tell! I love the gray dress in the first pic...top right. Where's that from? That one is more my style. I need A-line, this dress looks a little to fitted for me. Yes, please email it to me. Thanks for the heads up! Ok, I think I can do it. I have to look through my stash to see if I have something that is heavy enough, though. I really want to do it in a striped material. Wow, are all of these dresses really from the same pattern? I'm trying hard to use up my fabric stash, so I'm going to rummage through things right now to see if I can make this dress all from things I have on hand. Woo-hoo! I'd love to do this, but do you think I could scale it down to more of a size 0? I know, I'm ridiculously "petite." Ugh. I downloaded the pattern and put it together and it appears that the back yoke pattern piece is missing. Has anyone else had this problem? Also, the illustration shows pockets and there is no pocket piece -- I think that may be a mistake as the instructions do not mention pockets. If you start on monday - will do my best to join in...I love the design and have wanted a dress like that for a while. Looking forward to Monday! Thanks so much for doing this again! I have a stupid question, do we have to remember to add seam allowances? love this dress. Can't wait to get started. I have never sewn anything for myself. I'm so excited. I'm going to try to convince my friend to do it too! I am in! I am digging that emerald green. How much fabric do you think I would need to make this knee-length? I didn't see a cutting layout. Thanks. Adorable! I would love to make this and I think I could start Monday! I would also like to be able to make longer sleeves as well if you are able to include those instructions, if not it will still be just as cute! Thanks for sharing! Ok I'm going to need to go fabric shopping and other tool shopping. I literally just have the machine still sitting in the box. What else do I need to start something like this? I printed the pattern as well. The collar is there, it just is more "peter pan" shaped. And the front yoke and back yoke are one piece that will fold over our shoulders. But as far as I can see, the sleeve pattern really is missing. Ditto the pocket. It also looks to me like the pattern has a huge amount of ease. I'm sizing down considerably. Count me in! Looking forward to a new dress in a week. Oooo yay! I just found your blog and am all set for a Monday start!! I'm really excited to participate this time around, I was a couple of days late with the last dress. I'll be ready this Monday. Oooh, I'm in too---going shopping tomorrow---my first official fabric shopping trip in Japan! I'm so excited! I can have all my things ready to start for Monday. hmm. I think my post got eaten. regardless, while I have the perfect fabric, I don't have the time. Further to Ashley and Sally's posts and my post, the yoke is indeed in one piece, the collar is there (but labelled with the wrong number) but the sleeve facing/sleeve is missing. Looking at the instructions, I think the sleeve is just a narrow piece which is the same shape as the armscye folded in half but I can't be sure. I can't wait to pick out my fabric! In the end it will be fun to see what everyone else chose for fabric. I got fabric today, and will be ready to do it, even though I have a really busy week. :) I can't wait! How wide does the elastic need to be? I'm in... now wish me luck on finding a non-knit or non synthetic here in Colombia. I am so excited about this dress. Perfect for work and it will be nice to sew along with fellow sewists. I printed out, pieced the pattern and have cut out my fabric (thanks to the stash!). After cutting out the fabric, it is apparent that the collar piece #35 is missing. The sleeve facing is included and it is piece #34 and the instructions are correct. I spent quite a bit of time looking through the comments yesterday and the pictures to be sure about the missing piece. The link to the English instructions Michelle provided on 5/13 was helpful and we are missing a stand collar piece. I am excited and ready to start - thankfully the collar is the last piece to apply in the instructions. Does anyone know how to the pattern piece from Bernina? Thank you for hosting this wonderful idea of making a frock by Friday- I am sooo in! I'm looking forward to making this dress, just having trouble finding the fabric. Guess that means another trip to the fabric shop! I'm in! I bought fabric yesterday, and I'm going to throw it in the wash now. I'm loving the pattern, but I'm a little worried about the missing sleeve piece--I can't quite imagine how they intended it to work in the original design. i'm a newbie to your blog, which i love btw! i hope to keep up with everyone on this sewalong. i think the dress is great! I am such a beginner but have been looking around for some sewing classes locally and just haven't had any luck due to work commitments. Missed out on the last Frock by Friday sew a long and am so looking forward to this sew a long, am heading out today to grab some material, can't wait to get started. P.S. Came across your blog just a few weeks ago and am loving it.... Thanks! I am ready to start! I bought my fabric yesterday. What size bias? Single or double? I am sort of new to this sewing for myself thing. I love this idea and hope mine will turn out! I am excited to begin. Just went with Ramona (commented above) to get our fabric this morning together! First off, thank you so much for running these projects, I don't have the confidence to make my own clothes yet but with these tutorials I'm hoping it'll only be a matter of time before I'm making commercial patterns. They're greatly appreciated, I know they must take up a lot of your time. I'm a little behind and will be making this dress this weekend. 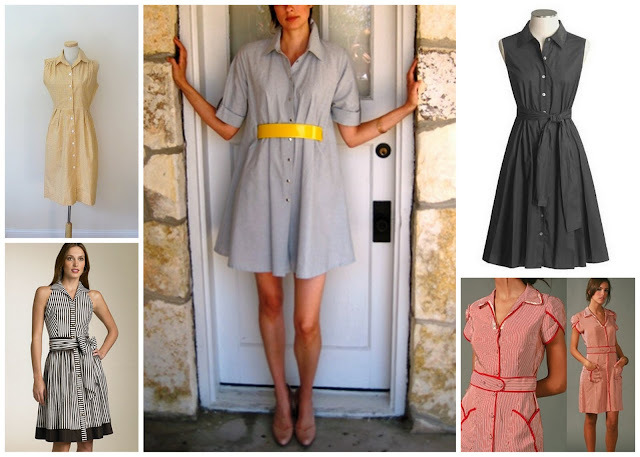 Can I just ask though, I'd like to make a version where the skirt looks a lot more like the dark grey dress on the top right of your examples on this post. Is there any advice you can give me on doing that? Is it just a question of adding more fabric to the skirt portions of the patterns? Lay the front skirt piece on top of the front piece of the bernina pattern to make a new shape. Do the same for the back piece. If you have problems printing it out, just send me your email address and I will send you the chopped up version. Thanks Kathleen, that's fab. I'm just printing it now and will see how I go! Hi! I was trying to find the dress pattern for this shirtwaitst dress but the links seem t have been changed/are broken. Is there any way that you could email me the pattern please? I too am looking for the pattern. Both the links are not found when I try and follow them.